‘The end of an era’ has been used a lot in the last few days in reports and articles about the situation in Zimbabwe. Precipitated by a decision to remove an erstwhile ally in preference for his wife – in a battle over ‘succession’ – the Zimbabwean army took control of the country and placed the country’s President, Robert Mugabe, under house arrest. As I write this the news has broken that Mugabe has resigned as President but whether this is the end of the story is another mater. Whether it be peaceful or violent, will end in smiles or tears, is still unknown. The events of the last week have only precipitated the inevitable. At the age of 93 Mugabe didn’t have much longer in his role as President and the situation in the country was about to change. But change, although inevitable, does not always happen for the best. When Mugabe goes it is an end of an era for him but also for the anti-colonial struggle within the continent of Africa. When Independence was declared in Harare on April 18th 1980 this followed the example of a number of countries that had achieved Independence through armed struggle. Mozambique, Angola and Guinea-Bissau/Cape Verde islands had achieved their freedom from Portugal five years earlier and in the process weakening the Fascist regime in Lisbon so that the Portuguese people were able to topple the Caetano regime. Most of the nations that had achieved independence from their colonial oppressors in the years after World War II quickly became mere client states of imperialism with only a semblance of independence. Any attempts at building a new sort of society, for the benefit of the workers and peasants of the continent, were crushed in the Congo with the murder of Patrice Lumumba at the beginning of 1961 and the experiment in Tanzania had yet to fall apart. So the group of avowedly left-wing nations, with various levels of developed Socialist ideology, that had gained freedom in the 1970s offered some hope to the poor and oppressed and sent shivers down the spine of imperialism worldwide. Britain was peeved, on both the Tory and Labourite sides of the political spectrum, that Mugabe won a landslide in the elections held in February 1980 – they would have preferred Joshua Nkomo who was much more malleable and pro-capitalist. If Mugabe wasn’t a Marxist-Leninist (although he used Marxist terminology) then the fact that he was so feared by the white, imperialist establishment earned himself a lot of credibility. There was a great deal of hope and expectation in the newly independent Zimbabwe. During the 1970s most attention in the anti-apartheid movement was directed towards South Africa and its racist Boers. There’s no doubting that South African society was rotten to its core but the figures demonstrate that what used to be known as Rhodesia was a country where the black population existed solely to serve the white minority. In the early 1980s the whites in South Africa made up a third of the population. Just before the final victory of the Zimbabwean Independence fighters towards the end of 1979 the white population of Rhodesia number was no more than 250,000 – with a black population of about 7 million. That’s a ratio of 28 to 1. The privilege that came as a consequence of that ratio explains why the Rhodesian army fought in such a vicious manner to maintain their hold on the country. Using techniques that were employed by the Americans in Vietnam, such as chemical warfare as well as the establishment of ‘protected villages’ – to deny the guerrillas contact with the local population – thousands of black Zimbabwean men and women died in the final seven years of the liberation war when the fighting became more intense. In this life and death battle the Rhodesians were supported by the rich and powerful racist regime in Pretoria – who got many of their armaments from the Israeli settler regime in Palestine. By the time of independence the white settler population in the new Zimbabwe was down to about 100,000 but the agreement made in London, the Lancaster House Agreement of December 1979, maintained many of the privileges the whites had enjoyed for decades. Mugabe kept to this agreement – much to the anger of many of those who had fought in the Chimurenga (Liberation War), presumably with the idea that the British would keep to their side of the agreement in assisting the country to move to a situation where the wealth created in the country would be for the benefit of the majority. If that was the case that was foolish – no one should ever trust the British. The term ‘perfidious Albion’ exists for a reason. The whole society was skewed in favour of a very small group of people and to change that so the majority could have a decent lifestyle was both difficult and expensive. Promises made during the 1970s that education and health would be provided for all were, in the main kept, but this took a huge amount of resources. Education is something that has to be paid for now in the expectation of returns in the future. But by the time these young people had been educated the situation had moved on – and not to the benefit of Zimbabwe. Although the battle had been won against the Rhodesians the white South Africans continued the war, taking it into the sovereign country of Zimbabwe itself by making a number of assassination attempts against members of the African National Congress (ANC) who were living there. In October 1986 the President of Portugal-free Mozambique was assassinated by the South African government. The Boers also supported the collaborationist forces of UNITA in Angola. So after gaining independence from colonialism Mozambique, Angola, Guinea-Bissau/Cape Verde Islands and Zimbabwe found themselves, to a greater or lesser extent, continuing to have to fight for their existence. The failure of the ANC in South Africa to mount a real and determined liberation war against their own government didn’t help. Corruption started to appear in all these countries and in Zimbabwe by the middle of the 1980s. A report produced by the Domestic Workers Union in 1986 concluded that the black ‘servants’ were even being treated more harshly by their black employers than they were by the whites. (That shouldn’t be a surprise. Southern African racism was heavily paternalistic and considered the black population like children – something I consider even more insidious than the vicious form of racism that exists in the United States. On the other hand the black employers who took on some of the roles of those whites who had fled the country just treated their servants as people who they had to get as much from whilst giving as little as possible in return.) Mugabe made a serious mistake by not stamping down on this corruption and abuse of power with an iron fist as soon as it arose. For the whites in Zimbabwe it was very much business as usual – they carried on their colonial lifestyle very much in the same way as they had since WWII, when there had been a large influx of settlers from Britain – many of them working class. They owned the best land, that being the land closest to reliable water resources, and whilst the maize (the basic food stuff) of the small farmers wilted during the drought of 1986-7 the commercial crops, like tobacco, of the large white farmers thrived being irrigated from the waters of Lake Chivero (formerly Lake McIlwaine). Support, both financial and logistical, promised by the UK government to reverse the inequalities created by colonialism (especially in land redistribution) weren’t forthcoming and by 1990, after the ten year period of grace for the whites, Zimbabwe found itself in a shaky situation economically. The world had also moved on in that ten year period. Neo-liberal economics dominated and any money from the International Monetary Fund or the World Bank came with conditions – primarily the selling off of state enterprises and the opening up of the country to foreign interference, the unequal agreements that have caused havoc throughout the poorer parts of the world. A small group can benefit but society in general loses out. To his credit Mugabe resisted these pressures but it came at a cost. When land redistribution became a major issue at the end of the 1990s the matter was pursued chaotically and on an individual basis. This taking back of the land should have occurred in the 1980s and in a structured manner, establishing something akin to collective/State farms on the bigger and most productive properties. Once capitalist property rights were challenged imperialism got together and imposed sanctions on the country in the hope that the colonies they once dominated could be brought under their control again. But Mugabe stood out against this interference but by now the situation in the country was worsening. In isolation, all the other countries that had gained independence in the 1970s having fallen into the arms of imperialism earlier, Zimbabwe’s situation had no real way forward that would benefit the people of the country. Opportunists saw their chance and when Mugabe made a silly political error they were ready to pounce. That brings us to the situation at the moment where Mugabe has just resigned as President. But this military and political coup was a long time in the planning, the rebels just waiting for an opportunity to take action. A simple look at the sort of professionally produced posters that were seen on the streets at the ‘spontaneous’ demonstrations over the weekend of the 18-19th November 2017 indicates that this crisis had been anticipated and prepared for long since. Mugabe made many mistakes however he did maintain independence for his country, he didn’t cave in to international pressures (although he did look east towards capitalist China to help in recent years). And it is here that we have the ‘end of another era’. The era of anti-colonialism, the era of independence for those countries that had thrown off the yolk of colonialism, the era when ordinary working people had the hope that freedom from white, European rule could mean they could take their fate into their own hands, that they could use the immense wealth of their countries for the betterment of themselves and their children. 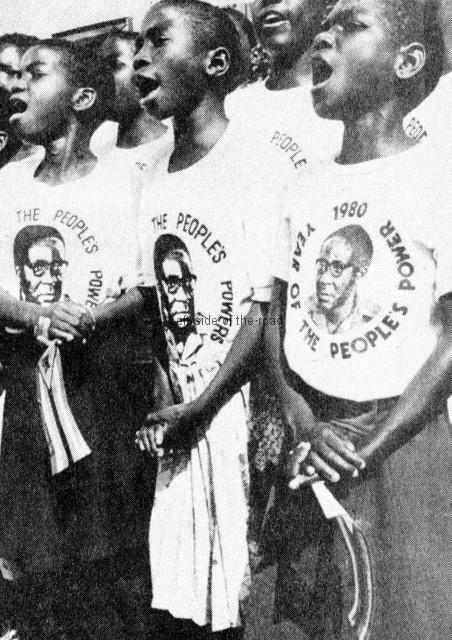 Those that now hold the reigns of power, even if they were fighters in the Chimurenga, do not hold have a view of the future that is for the people. They are openly ‘free trade’ in their outlook and it will only be a matter of days before they are opening their country to the ravages of globalisation. State industries won’t stay in public hands for long and the ‘prosperity’ that might arrive in the future will be that for a selective view. With the fall of Mugabe Africa no longer has a country which isn’t, in one form or another, under the control of those very forces so many fought against from the end of the 19th century, culminating in the liberation wars of the 1970s. Those brave and courageous men and women who died thinking they did so for a better future have finally been betrayed by all the nations of the continent. What has happened in November 2017 is indeed an ‘end of an era’ – the end of an era where people were prepared to fight, and give their lives, for dignity, freedom and the right to determine their own future. When shall we see their likes again? Considering that the period covered was one of the most dynamic and crucial in the development of Black Southern Africa the film Mandela: Long Walk to Freedom is remarkably pedestrian, slow, ponderous and ultimately unsatisfying. This isn’t surprising when you consider that the whole emphasis is placed on an individual with political events merely being a historical backdrop rather than looking at those events and analysing how any individual relates to the greater whole. Being based on Mandela’s autobiography (of the same name) published in 1994 (a 750 pages doorstop that seems to have been his primary aim after release as he wrote this prior to his being elected South Africa’s first Black President in April 1994) this perhaps is not surprising but I would have thought that a film based in a period of massive upheaval and conflict should have recognised that social movements have a momentum of their own and that an individual’s role should be measured, for good or bad, in how it progresses that social movement. The film is basically in three parts. At the very beginning we are presented with an idealised childhood and youth in the South African bush. When he goes off to study at University Mandela’s wish is only to become a successful and wealthy lawyer. He’s a smart-arse lawyer and we are shown an episode in court where he wins a case by playing on the racism of a white woman. She is so disgusted at having to answer questions from a ‘kaffir’ and having to justify to him that a pair of knickers are hers that she walks out of the courtroom and the case collapses. So we are introduced to the Mandela who is a clever and astute lawyer. But in this period he’s not especially interested in politics. This is the 1940s, before the formal establishment of Apartheid, and although the formal and legal institution of that system has yet to be written into law we are still dealing with a racist and segregated society. But Mandela, although having contact with the African National Congress (ANC), seems more concerned about using the pistol in his trousers than any true weapon against the State. 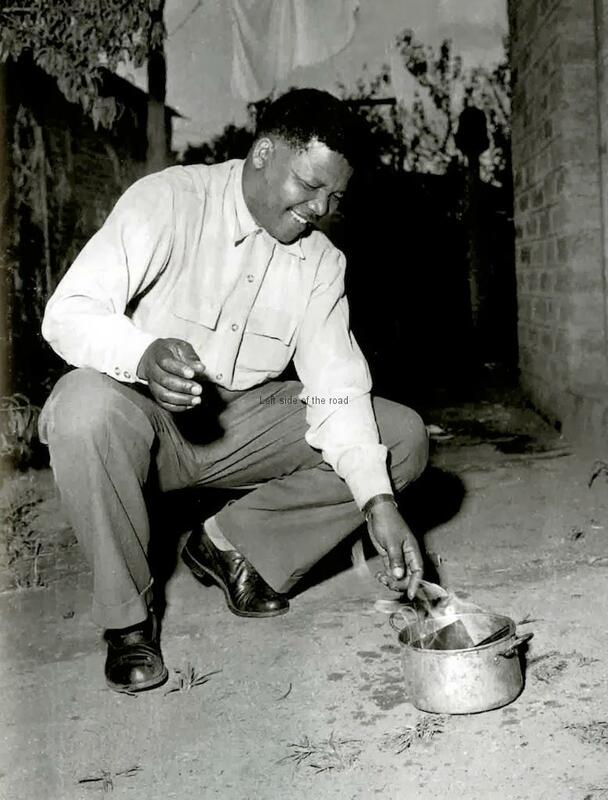 When, as a result of the openly racist National Party in the whites only election in 1948, strict segregation of the races is enforced and Mandela moves into a house in the Orlando township he is given a speech were it gives the impression that he is the only one who really understands what is going on in the country – here the film seems to play around with the timeline of events for dramatic effect. This establishes a theme that continues throughout the rest of the film, Mandela knows best, Mandela is the one who doesn’t break when the pressure is applied, Mandela is the clear and thoughtful leader who sees the future whilst others are lost in a wilderness. In this way any voices, either in agreement of otherwise are totally ignored. We get the start of the hagiography that is the film with demonstrations of his ability as a public speaker, a demagogue who says what everyone else is afraid to say – and throughout the rest of the film very few significant statements are made by any of the other characters. In such street meetings the camera flashes to other ANC supporters who look concerned when Mandela makes a statement that might be construed as inflammatory and going too far and which might bring down the wrath and anger of the white racists. This despite the fact that the film, in an earlier scene, shows that many in the ANC were challenging the system BEFORE the active involvement of Mandela. He was not a leader from the off and, in fact, although not shown in the film, Mandela later became instrumental in side-lining the more radical elements within the movement. Towards the end of this first third he develops as an egoist and self publicist having the newspaper cameras around when he burns his passbook. 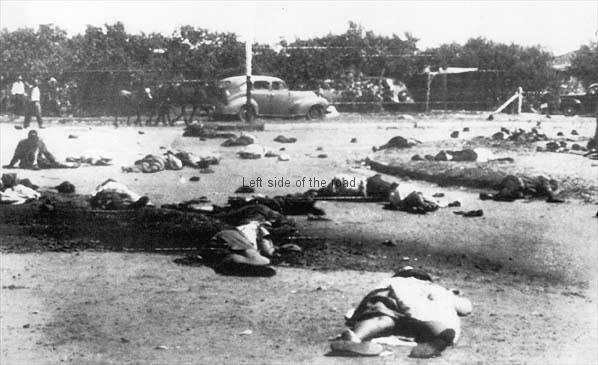 This follows the Sharpville massacre of May 1960 in which 69 people were butchered during a Pan-African Congress (PAC) organised protest against the obligatory carrying of identification papers. The PAC was much further to the left than the ANC and the two organisations vied for the mass support of the South African population. In those pictures he’s smiling as if it were yet another photo opportunity and demonstrates how he rode on the backs of others who had taken the initiative – not for the last time. The only period in the whole of his life where Mandela might be vaguely considered to have followed a revolutionary road was during the first couple of years of the 1960s. Then he followed some military training in Algeria and this period saw the establishment of Umkhonto we Sizwe (Spear of the Nation, known in shorthand as MK), the military wing of the ANC. This organisation limited itself to sabotage activities in its beginning and rarely went much further for the rest of its existence and it was the activities of MK that led to the arrest and trial of Mandela and others from the ANC leadership. Much has been made of Mandela’s closing speech at the Rivonia trial of 1964 where his last words were ‘it is an ideal for which I am prepared to die’. This was inspired by Fidel Castro’s speech after the failed attack on the Moncada Barracks in Santiago de Cuba on July 7th 1953 and considered the start of the Cuban revolution. Castro’s last words were: ‘Condemn me. It does not matter. History will absolve me’. (Don’t you ever get the impression they were speaking with history in mind rather than anything else?) It is true that they could have been sentenced to death at this trial but the Afrikaaners were to deny them their desire for martyrdom and instead sentenced them to life imprisonment. Fine, stirring and defiant these final words might have been but a better idea of Mandela’s political thinking, which he maintained till the end, can be understood if the whole of the speech is read, where, among other things he speaks of his admiration for the British establishment. The second section of the film concerns his time in prison. Yet again all the other inmates become mere cyphers. For example, on arrival at Robben Island prison he is shown as the only one remaining defiant as when he shouts out ‘Amandla’ (meaning ‘power’) which would expect the reply ‘Awethu’ (‘to us’) Mandela’s call is met with total, demoralised, silence. Being a prisoner was the most significant role that Mandela played in the South African liberation struggle and became the symbol for anti-Apartheid campaigns throughout the world. For 18 years he was isolated from the struggle like all the other prisoners on Robben Island and wasn’t aware of or in any way involved in the direction of the struggle as it intensified. Throughout the late 1970s and early 1980s one after another of the countries that had been dominated by European colonial powers gained their independence, often after bitter, bloody and determined armed struggles. It was in this way that Zimbabwe, Mozambique and Angola gained their freedom from direct foreign control (but not from international capitalist interference). Things were starting to get out of control in South Africa and fearing the country would move much further to the left after any possible victory in the liberation struggle Mandela was brought back into the political process to create division and promote moderation. This very selection of someone who had been out of contact with the everyday struggle becoming the representative of the black population says a lot about the failure of the ANC to make any significant inroads during their so-called ‘armed struggle’. This, third, section of the film plainly shows the attitude Mandela had to any sort of collective leadership and decision-making process. Probably the most significant discussion amongst his fellow prisoners and the clearest political stance (and the only one in the film) they took was totally ignored by Mandela. When they voted that he shouldn’t be meeting with the ‘The Boer’ leadership by himself his response was ‘I take note, comrades, but I will do what I think is right.’ He assumes the inalienable right to be the only capable of making the ‘correct’ decisions! At the same time we are shown that he is becoming increasingly estranged from his second wife, Winnie Madikizela, who, living and fighting in the townships, had realised that the situation had changed radically from what it had been at the beginning of the 1960s when he had been tried and imprisoned. In this third part of the film we see Mandela playing everything as a one man show. He calls for unity when it’s his ideas that are being challenged, using his international reputation to beat down his opponents. He accuses Winnie of not following the capitulation ANC leadership as she calls for the struggle to become a true armed struggle and not to continue to throw unarmed children in the battle against machine gun-toting thugs in armoured vehicles. Despite this open individualism and depicting his political manoeuvring the film still arrives at the general consensus in the end, that of a patient, elder statesmen who considers that peace with the white oppressors is preferable to true liberation for the South African working class, both black and white. It was for that reason he was so fêted at the end of last year after his death on 5th December. His legacy being a South Africa where the same political and economic forces are in control, albeit with some black faces feeding at the trough, and an increasingly desperate situation for the majority. Who’s mourning Nelson Mandela – and why? In May 1929 Mao Zedong wrote a short article entitled ‘To be attacked by the enemy is a good thing and not a bad thing’. If a revolutionary does something that challenges the capitalist/imperialist system then their representatives will do their utmost to discredit, undermine and denigrate those revolutionaries involved in order to destroy their attractiveness to the oppressed masses. In the same way they will praise to the skies anyone who, under the guise of ‘fighting’ for the oppressed actually are no more than a lackey of the ruling class. It is in this light that we should look at who’s mourning Nelson Mandela – and why. International politics is not civilised. There’s too much at stake, not just in terms of wealth but also control, prospects for the future and the long-term existence of particular social systems. At the moment there’s only one political system that’s able to have a significant impact upon matters globally and that’s the system of exploitation and oppression known as capitalism. For a good part of the 20th century this moribund and decadent system was fighting a rear-guard action against the progressive system of socialism, first with the establishment of the Soviet Union after the 1917 October Revolution and then the dramatic success of the Chinese Communists and the declaration of the People’s Republic in October 1949. The Soviet Union took the revisionist road in the years after the death of Joseph Stalin and China went even quicker down that capitalist road within months of the death of Chairman Mao. The reasons for those dramatic developments have been, are and will be subject to debate and an analysis which is too complex to go into here. Suffice it to state that this caused confusion and disarray amongst revolutionary forces throughout the world and it’s impossible to calculate the consequences of these traitorous moves on the poor and oppressed throughout the planet. However, it wasn’t until the collapse of the Soviet Union as a viable entity in 1991 that imperialism felt confident enough to go on full-scale attack and recover its dominance over the world. This covered: the economic – with the whole scale privatisation of the people’s resources in whatever country under the guise of restructuring and efficiency; the philosophical with, for example, the publication of Francis Fukuyama’s ‘The End of History and the Last Man’ in 1992, which argued that capitalism was the epitome of human development; and the cultural with the widespread dissemination of English language films and the ubiquitous presence of capitalist ‘icons’ such as McDonalds and Coca/Pepsi Cola. It was into this environment that Nelson Mandela was released from his 27 years imprisonment under the neo-fascist South African apartheid regime. The timing of his freedom couldn’t have been better chosen. As early as July 1987 debate was taking place amongst the South African establishment of the necessity or otherwise of the apartheid regime in maintaining capitalist control of the country. Newspaper articles at that time looked to the lack of significant change in the economic structure in neighbouring Zimbabwe since Independence in April 1980 and argued that capitalism had little to fear from Black majority rule. In Zimbabwe the status quo had not been significantly challenged. This was partly due to Mugabe honouring the conditions of the Lancaster House Agreement (signed in London on 21st December 1979) but also to a lack of real political understanding by the leadership in Harare. At the time I considered that Mugabe and pulled off a coup against the white Rhodesian supremacists and their British supporters but have had to revise that opinion in the light of subsequent developments. The ten years of grace given to the white racists allowed them to consolidate their control and also to undermine the revolutionary forces by seducing the weak and fomenting disillusionment amongst the true revolutionaries. Later pressures and restrictions placed upon the country by the World Bank and the International Monetary Fund throughout the 1990s only made matters worse. When land seizures became more prevalent at the beginning of the 2000s it was too little, too late and led to the chaotic situation that has bedevilled the country in recent years. Only now with the support of capitalist China is Zimbabwe able to drag itself out of the mire but only to change one master for another. So by February 1990, when Mandela was released from prison (less than three months after the fall of the Berlin Wall) his role as mediator between the extremes of the apartheid regime and the Azanian revolutionaries was crucial in maintaining South Africa in the capitalist orbit. Leaders that spend such a long time in prison, separate from the day-to-day struggle, are notoriously bad at understanding the contemporary situation. He went in with certain political ideas and views and came out with those same views 27 years later. 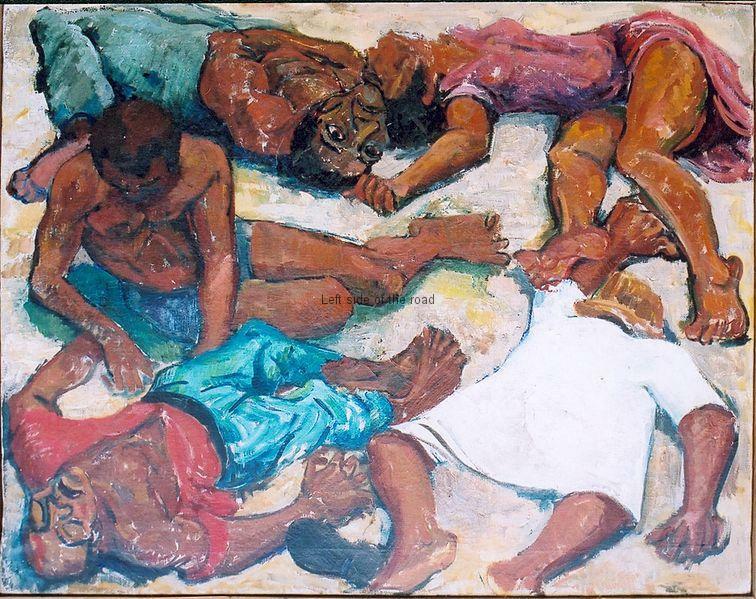 Subject to the oppression of the apartheid regime in a passive sense he hadn’t experienced the viciousness and violence to which the people of the townships were increasingly being subjected. In that way Winnie Mandela was a better representative of the ordinary people. On the balcony in Cape Town the biggest cheer in his speech was that in response to his declaration that the armed struggle would continue – this from a man whose attitude to such a course of action was ambivalent to say the least. In that same speech he also spoke of reconciliation but in the climate of the time, with the general impression and feeling that the regime was on the run, that the long, long years of oppression were almost at an end, there was a mismatch between the masses in the square and the individual on the pedestal. But those behind the scenes knew exactly what was going on. I’m not necessarily saying that Mandela made an agreement to secure his release. He didn’t need to. If anyone was to read his defence speech at the Rivonia Trial of 1964 (the one that ends with the words ‘ …. I am prepared to die’) rather than just refer to it as ‘one of the most famous speeches of all time’ they would realise that Mandela spent more time saying what he didn’t agree with than what he did. Being in prison, isolated from the struggle, not developing his ideas as the struggle in the country intensified, to be of use to the Afrikaaner state (and its imperialist backers) he just had to remain intellectually where he was in the early 60s. And he did. Pik Botha, and later FW de Klerk, knew Mandela wasn’t a hot-blooded revolutionary who wanted to fundamentally change society. He would be happy with the end of the apartheid system even if it didn’t change the basis of South African society. Never did Mandela express any support for, real understanding of and a desire for the establishment of socialism let alone communism. He stayed loyal to his class background and presided over a Black majority state where the conditions of the people got worse instead of better. It’s one of the contradictions of ‘freedom’ in the late 20th and early 21st centuries. In 1987 Zimbabwe was ‘free’ but was still restricted by capitalist control of the economy but across the border in South Africa the people weren’t ‘free’ but the standard of living of those in the townships was often higher than those of comparable workers in Harare. The people in the erstwhile Soviet Union and the countries of Eastern Europe are now ‘free’ but things like education, health, welfare services and elderly care are increasingly out of reach for many of the poorest in society. Forces within Africa, particularly the Pan-African Congress, did have the shoots of a socialist ideology but the ground was taken from under them with Mandela’s release. Very soon after his release he became the darling of the ‘west’ and the ‘east’ (he made a visit to Cuba) and soon it appeared that the only person who could talk for the Azanian people was Nelson Mandela and the African National Congress (ANC). People believed the empty promises as his release presaged a better future for everyone. These empty promises were believed in the same way that ‘democratic’ politicians promise the world before elections but deliver nothing when in power – just consider the mismatch between promises and reality in late 20th Britain. And those promises were made for the same reasons, to try to deflect the people from taking more direct and significant action. Mandela gave greater credibility to the right-wing within the ANC which wanted no more than black faces in control of the society as it was. Even though there were some within the ANC and Umkonto We Sizwe (Spear of the Nation) – the armed wing of the ANC – that considered the armed struggle the only way to true liberation, especially in the early years (see copies of Sechaba from the 1970s), it never had the impact that was achieved by the other liberation movements in other countries fighting European colonialism and racism as in Rhodesia, Mozambique, Namibia, Guinea-Bissau and Angola. In fact, the armed movement was so ineffectual in South Africa that the apartheid regime was able to send its forces to try to claw back what the ex-Portuguese colonies had achieved through long, bitter and painful liberation wars. Nelson Mandela became the ‘First Freely Elected Black President of South Africa’ in 1994 and in his wake revolutionaries faded into the background, corrupt black politicians and business started to feed at the trough once exclusive to the whites and the poor, both black and white, remained poor. What, it seems, is often forgotten in the context of Southern Africa is that the ratio of blacks to whites in South Africa was about 3 black to one white in the 1990s. That meant that poverty wasn’t just the fate of the blacks. Some blacks lived in relative luxury in Soweto – the township to the south-west of Johannesburg – whilst poor working class whites might be homeless and begging on the streets. Contrast that with the situation in Rhodesia before independence when the ration was something like 27 blacks to one white and which led to an even more vicious and vindictive society. As the whites had much more to fight for that resulted in 47,000 black Zimbabwean deaths in the National Liberation War between 1973 and 1980. And that situation remains almost 20 years later. Instead of uniting and fighting against the system that oppresses them all the workers, of whatever colour, are fighting amongst and against themselves and leaving the rich and powerful to carry on in the old way. That’s fundamentally Mandela’s legacy. He didn’t want a revolution and those that did never realised that a revolution is not a dinner party (as Mao described in an article in 1927). A revolution is messy, violent and unpredictable. The only ones that can gain by avoiding such a situation is the present ruling class. They can/will be contrite and make all the apologies necessary, as long as their wealth and power are not challenged. On the other hand the exploited and oppressed can only end their exploitation and oppression by challenging the world order, by turning the world upside-down. And that’s why world leaders, both past and present, are falling over themselves to shower Mandela’s corpse with praise. He stopped people from doing that. This is all shown in the film that came out at the time that must have had the producers rubbing their hands with glee – just weeks prior to his death. The film Mandela: Long Walk to Freedom showed quite clearly where his politics lay. If to be attacked by the enemy is a good thing and not a bad thing then being praised by all those who spend all their time and efforts maintaining the system of inequality and injustice is a bad thing and not a good thing.